I think it’s the slow pace of life and the small-town feel that impressed me most. Battambang, in northwest Cambodia, is a social and welcoming place. No one’s in a hurry. Sitting down, having a cool drink, and meeting new people is a popular pastime. And when I walked around town, people would come out to talk to me and freely share what they enjoyed about living here, or which restaurants they liked the best, or when the latest opening of an art gallery was to take place. It doesn’t feel any different now than when I first visited it almost 10 years ago. There are some new businesses, some fresh paint, and a number of the old French buildings have been carefully restored. But there has been very little new construction other than the major roads. Most streets are still dirt. Some of the same vendors—or maybe their grown children—still sell from the same street corners. The nearby Angkor-era (9th to 15th centuries) ruins are still nearly deserted, and whatever restoration work that is planned for them is being done on “Cambodian time”: slow and unhurried, just like Battambang. You can walk from one end of the town center to the other in about 30 minutes, following the paved walkways that line both sides of the Sangker River, which runs through the middle of town. Well-maintained parks along the river banks are a draw for the townsfolk, who come to play with their children at the playgrounds, meet their friends and sweethearts, enjoy the shady benches, and work out on the exercise equipment. On either side, Buddhist wats (temples) provide a tranquil refuge for inspiration, rest, and reflection. Several huge neoclassical Beaux-Arts mansions, with imposing and ornate entrances, dramatic columns, and extravagant balconies, are scattered around town—leftovers from the days when Cambodia was a French colonial possession. Most buildings in the downtown area are at least 100 years old. 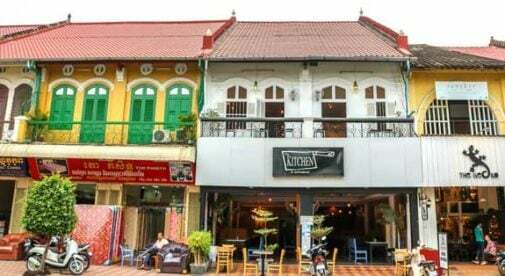 Quiet streets are framed by French-colonial shophouses, with businesses located on the ground level and living quarters, often with large overhanging porches, wrapped around the second level. “Battambang is a very creative city,” says Robert Carnack from Oregon, who co-owns and operates a B&B and artisanal boutique. The many ancient temples in the countryside surrounding the city are similar to the world-renowned temples in Siem Reap, yet they receive very few visitors. Exploring the ruins without bumping into crowds of tourists is a National Geographic kind of experience. Wat Banan’s five towers echo the Hindu influence of Siem Reap’s famous Angkor Wat. The ruins, which have not yet been restored, sit atop a hill about 11 miles from town. Wat Ek Phnom, just seven miles from Battambang, is the most visited ruin in the region; however, on weekdays you’ll probably have the temples all to yourself. Its huge Buddha statue sits within the partially collapsed ruins of an 11th-century temple. Both temple complexes are easily reached by motorbike or taxi. 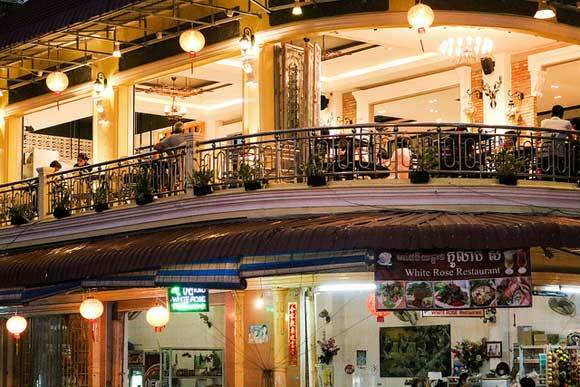 Two of the nicest restaurants in town, Au Cabaret Vert and the Bambu Hotel Restaurant, offer fine Cambodian and European cuisine. A meal for two at either restaurant, with an appetizer and drinks, won’t cost more than about $38. Most other restaurants in town are much less expensive, and dinner for two, including drinks, will cost $20 or less. 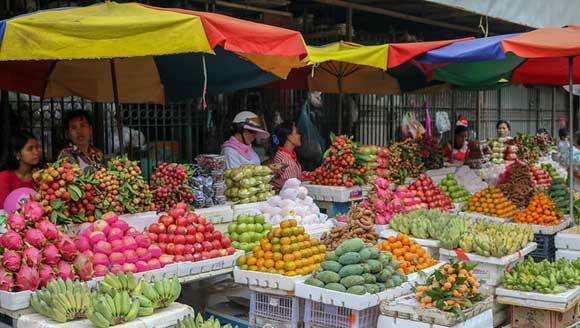 Of course, if you eat where the locals eat, you can find cheap and healthy food for just a dollar or two. Beer at a restaurant costs about 50 cents. In keeping with Cambodia as a whole, the cost of living in Battambang is wonderfully low. Renting a house is particularly inexpensive. Houses with modern, Western-style conveniences range from around $205 to $409 a month. Small, two-room furnished apartments, with a swimming pool, housekeeping, and most utilities included, will cost less than $285 a month. The expats I spoke with all say that their biggest housing expense is electricity. Most of them report spending at least $80 a month for electricity and say that it would cost much more if they used the air conditioning. Battambang enjoys warm weather year-round. During March and April the weather can get quite hot, with temperatures regularly reaching 100 F or more. Battambang is small enough that owning your own wheels is optional. Pat, who prefers to walk whenever possible, says, “If I do choose to have public transport, I can take either a motorbike taxi for 50 cents or a tuk-tuk for $1.” Tuk-tuks are everywhere and rarely charge more than $1 per person for any destination within a mile of the town center. Owning a bicycle (as many expats do) eliminates even that low expense. The closest commercial airport is a three-hour drive away, in Siem Reap. The main transportation hubs are in Phnom Penh and Bangkok. Taxis, 16-seat vans, and long-distance buses serve these destinations daily. Many of Battambang’s year-round expats have settled here after having first lived in another Asian city. Moving to a relatively small community requires adjustments, and gaining experience in a more populous area can help smooth the way. “I’ve lived abroad long enough where patience is not a word that I’m afraid to use,” says Jeb Jones, from Savannah, Georgia. However, Battambang has been a pleasant adjustment for him. U.S. citizens looking to relocate to Southeast Asia are quickly noticing that Cambodia has one of the most accessible visa policies in the region. All you need to obtain a visa on arrival is to hold a passport with six months’ validity and blank pages, ﬁll in a short immigration form, and have one passport-sized photo. Even if you don’t have a photo, you can pay a fee of just $2 to waive this. If you plan to stay for less than 30 days, you pay only $30 for a tourist visa (T) upon arrival at Phnom Penh and Siem Reap international airports. However, if you want to stay longer in Cambodia, you just pay an extra $5 for a 30-day “business” or “ordinary” visa (E), which can be extended for up to 12 months at a time and renewed annually. Make sure to visit a travel agency before your 30-day visa expires. (There are hundreds of them around the country.) They offer very fast processing of visa extensions for competitive fees. For about $30 you can get a one-month extension of a tourist visa. You can extend a business or ordinary visa for one month up to 12 months at a time, at a cost of $45 for one month up to $285 for 12 months. It is very important that you extend your visa on time. Immigration will charge $5 for each day you overstay your visa, rising to $6 a day after 30 days. After six months you can face detention and even deportation. 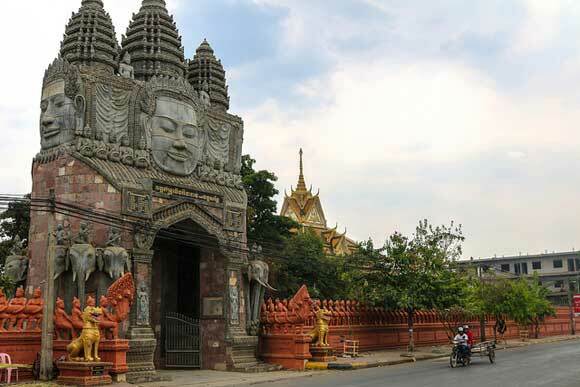 As long as you behave yourself and extend your visa on time, Cambodia is one of the best destinations in Asia for tourists and expats looking for straightforward and hassle-free immigration. Simply enter your email address below to sign up for IL’s free daily postcards and we’ll also send you a Free Asia Report-The Best Islands, Beaches and Cities: Southeast Asia’s Top 6 Retirement & Vacation Destinations.